In many episodes of fervent investment activity within a particular hot spot, like the current insurance M&A party, there is a point where you think “really?”. 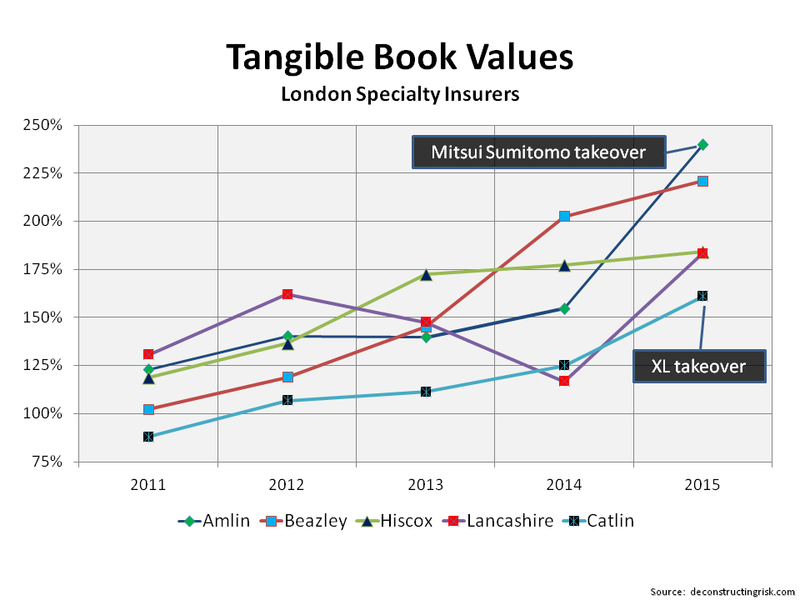 The deal by Mitsui Sumitomo to take over Amlin at 2.4 times tangible book is one such moment. A takeover of Amlin was predicted by analysts, as per this post, so that’s no surprise but the price is. 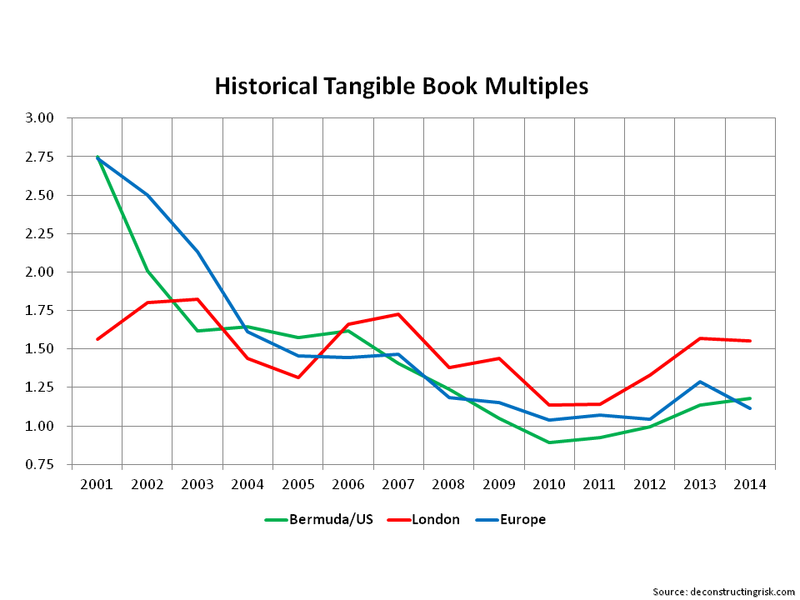 With the usual caveat on the need to be careful when comparing multiples for US, Bermuda, London and European insurers given the different accounting standards, the graph below from a December post, shows the historical tangible book value levels and the improving multiples being applied by the market to London firms such as Amlin. Comparable multiples from recent deals, as per the graph below, show the high multiple of the Mitsui/Amlin deal. Amlin has a 10 year average ROE around 20% but a more realistic measure is the recent 5 year average of 11%. In today’s market, the short to medium term ROE expectation is likely to be in the high single digits. Even at 10%, the 2.4 multiple looks aggressive. 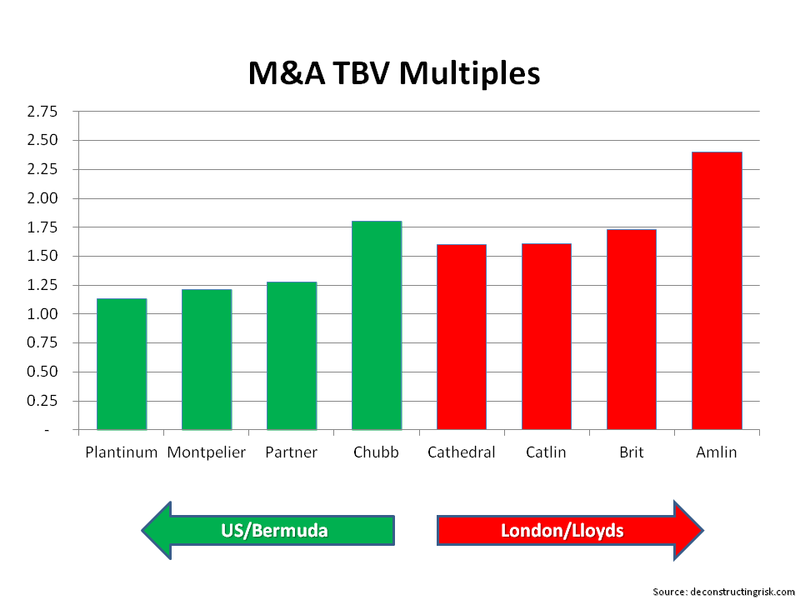 There is little doubt that the insurance M&A party will continue and that the multiples may be racy. In the London market, the remaining independent players are getting valued as such, as per the graph below tracking valuations at points in time. When the hangover comes, a 2.4 multiple will look even sillier than its does now at this point in the pricing cycle. In the meantime, its party like 1999 time!